The world of dredging is defined by the vast diversity of each assignment that contractors perform on any given day. Fortunately, DSC’s standard lineup of dredge equipment can be modified and customized to meet just about any job that needs doing. It wasn’t too long ago that retired U.S. Coast Guard Admiral Jim Loy told me, “If you’ve seen one port, well, you’ve seen one port.” That now-famous declaration was made in reference to port security in a post-9/11 world, but the quip is as valid now as it was when he said it during his tenure as Commandant of the U.S. Coast Guard. Similarly, it can also be said that if you’ve seen one dredging operation, well, then you’ve seen one dredging operation. Port-to-port, coast-to-coast, on inland rivers, Great Lakes, for environmental remediation, during storm restoration operations and everything in between, no two dredging assignments are exactly alike. No one knows that metric better than DSC Dredge President/CEO Bob Wetta, who weighed in with Marine News in January. In the beginning, it was Thomas J. Wetta, III (father of Bob & Bill Wetta) who was principal in a now dissolved entity named Kenner Marine & Machinery (KMM), incorporated in the early 1970s. In the late 1980s, the company went through a liquidation bankruptcy. Prior to the liquidation, a friend/investor Bob Dagley of Thomas Wetta opened a company named Dredging Supply Company. The function of this company was to take over the business model of KMM through hiring a majority of the workforce and by obtaining knowledge of dredge manufacturing through the employees. The verbal agreement was that once the company was up and running, the Wetta family would purchase the company back. An entire article could be written on how all that came about, and how Bob Wetta ended up where he is today. Dredging Supply would one day end up back under Wetta ownership, a corporation with the name of Dredging Specialties, Inc. Dredging Specialties had minor operations/sales under it from 1992 to 1994, but the majority of revenues came from Dredging Supply Company. Fast forward to 1994, and Dredging Specialties dropped its name and took over the name Dredging Supply Co., Inc. Through merger of several related companies together over those years, DSC Dredge, LLC was officially formed as the holding company in 2010. Today, DSC Dredge, LLC operates from three major manufacturing facilities located in Reserve, La. ; Poplarville, Miss. ; and Greenbush, Mich.
Last year alone, DSC had 21 major projects either in production or delivered. But each is as unique as the hundreds that preceded them, and the hundreds that are likely to follow. Wetta says that’s no accident. DSC prides itself on providing a ‘customized’ service for its customers. 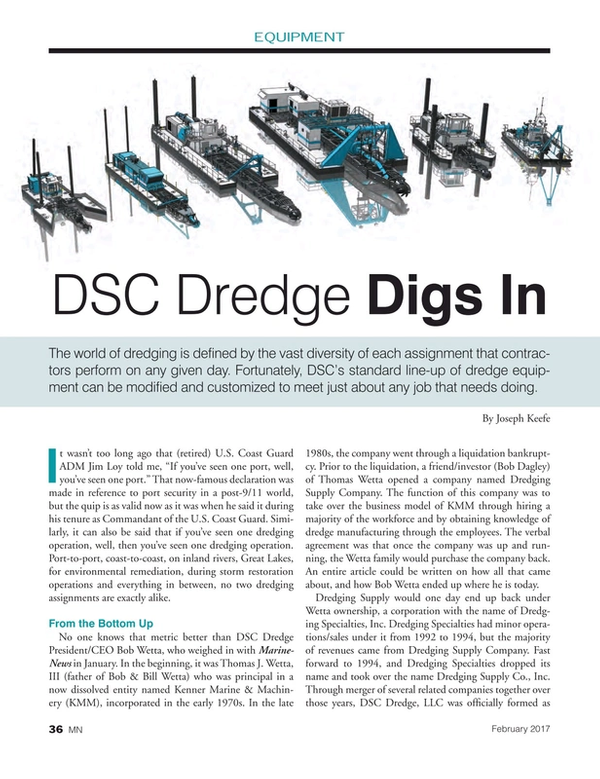 “DSC has manufactured the deepest sand mining dredge in the western hemisphere, with a dredging depth capability of 200 feet. DSC is just completing an aggregate dredge that will dredge to 155 feet deep. DSC has built the newest dustpan dredge. The list goes on and on, and we typically add two to three builds like this per year,” said Wetta. DSC doesn’t just sell equipment. Training is always provided with a dredge sale, and at the same time, field services for additional training, new operator training and for maintenance training. DSC offers classroom-style training at a minimum of twice per year. That classroom-style technical training is offered to anyone in the dredging industry; whether you own a DSC dredge or not. One repeat customer underscores the value of a satisfied customer that also had new challenges. The winter of 2016 was an unusually harsh one for the Santa Cruz Small Craft Harbor in Santa Cruz, Calif. The DSC-built dredge Seabright that had served the harbor for 30 years labored to keep up, and frequent breakdowns only compounded the problem. Fortunately for the harbor members and visitors, a new dredge from DSC Dredge, LLC – the Twin Lakes – was scheduled for delivery in June. The Seabright was at the end of its useful life. Enter the Twin Lakes, commissioned from DSC in April 2015, a custom-built, 16” x 16” dredge with a hull-mounted pump. It features a PLC operating system with color touch-screen controls, Global Positioning System (GPS), electro-proportional hydraulic circuits, high-capacity service water system and an inline direct marine-style transmission for dredge pump gear ratio reduction. A planetary winch provides the swing operation. A magnetic flow meter shows the operator the velocity of the material being moved, providing information on the dredge’s efficiency. With two engines – a Caterpillar C32 dredge pump marine diesel engine and a Caterpillar C18 marine diesel-powered electric generator – the dredge complies with EPA and California CARB environmental standards. Meanwhile, the Seabright is now for sale. That’s an impressive run for the DSC dredge; one which is probably not yet over. DSC has always produced ‘spec’ units out of its Greenbush, MI, facility. Wetta adds, “We have also recently added some ‘spec’ builds in our business model out of our other two facilities. The spec build dredges range from 8” through 18” discharge sizes.” That said; the real strength of DSC has always resided in the ability to give the customer what they want, where they want it and delivering that product on time. For example, the DSC Barracuda Class is really two dredges in one. The Barracuda dredge features a swinging-ladder design and is easily transportable, making it ideal for navigational, recreational or restorative projects, such as waterway maintenance and lake revitalization. Offering the option of two front-swing winches, the Barracuda Class is a two-in-one dredge that easily converts from a swing ladder dredge to a conventional dredge without sacrificing portability. Available in either diesel or electric power, discharge sizes range from 10 to 18 inches (250 mm to 450 mm). Separately, and in another twist to the ever-expanding DSC portfolio, the North Carolina Department of Transportation recently took delivery of a new, fully customized cutter suction dredge, which it christened the Dredge Manteo. The 154-foot state-of-the-art pipeline dredge, designed and built by DSC Dredge will work to keep North Carolina’s state-maintained intercoastal ferry channels clear. Because the state of North Carolina anticipated that its ferry routes will see more and more use, it was imperative that the DOT had a more modern dredge capable of dredging more material more quickly than its predecessor. The Manteo fit the bill nicely. Built to house two eight-person crews, with a full galley, four bunk rooms and two full bathrooms, the dredge also features a 78-foot deckhouse that contains the machinery area, crew quarters and galley. Far more efficient than its predecessor, the 16” x 14” Manteo is capable of dredging a channel to a depth of 30 feet. Spud carriages, which the original dredge did not have, easily move the vessel as it works. From the outset, DSC’s designers made several recommendations to improve performance that NCDOT agreed upon. These included increased horsepower of the engine and the diameter of the impeller. This allows it to effectively move more material over a 1.5-mile distance to the discharge point. And, the dredge includes a myriad of other high-tech features, including a GPD dredging system. Customization is the key for the DSC, but DSC’s diversified standard portfolio of dredging solutions can fit just about any need that you might have. For example, the Marlin Class underwater pump mining dredge is designed to meet the needs of deep mining and aggregate deposits by providing a more efficient tool for material excavation. Every Marlin Class dredge is specifically designed to handle a particular deposit—from sand and gravel to industrial minerals—to ensure maximum efficiency. Beyond this, DSC Marlin Class dredges are available in either a diesel- or electric-powered model to meet the customer’s specific needs. Still another DSC Dredge class, the Shark, features modular design for portability. Also offered in diesel or electric power, the DSC Shark Class cutter suction dredge features a conventional dredge-operating configuration with a modular design for ease of transportation. The reliability of the Shark Class cutter suction dredge design typically results in a higher percentage of operational time, and it often exceeds the typical lifespan of other dredges within the same class. The DSC Badger Class is ideal for smaller dredging jobs where more compact equipment is required due to work area limitations. With a working width of just under 10 feet and an overall length of 54 feet, including the ladder, the Badger can be maneuvered into harder-to-reach waterways, yet still dig to a depth of 20 feet at a 60-degree down angle on the ladder. The lateral cut achieved at maximum depth is approximately 50 feet. The Badger can be transported on a single truckload. Meeting Tier 3 diesel emissions requirements, a Caterpillar C7 ACERT engine provides 250 horsepower at 2,200 rpm, supported by a 150-gallon fuel tank. Sourced from Metso Minerals, the Thomas Simplicity Dredge Pump is rated for 160 feet Total Dynamic Head (TDH) at 2,500 gallons per minute. The five Rotzler winches are rated at 4,500-pound line pull capacity and are used for swinging the ladder, lifting the spuds and lifting the ladder. DSC’s portable Moray Class dredge is ideal for the current dredging industry trend of pumping low flow rates with higher-percent solids. Well suited for applications where flow rates need to be minimized, such as for pumping into geotubes or retention areas that do not accommodate large water volumes, the Moray is also well suited for shallow waterway maintenance, lake revitalization, aquaculture, environmental clean-up, erosion control and irrigation projects. This dredge was designed to be both highly productive and transportable. With discharge sizes of either 8 inches (203 mm) or 12 inches (305 mm), this model meets most single-truck hauling requirements. Last but certainly not least, the Wolverine Class dredge is a compact dredge ideal for sand and gravel producers and construction contractors. Functional with just one operator, the Wolverine can dig up to 25 feet below the surface and allows for maximum particle clearance of 6 inches. This tough yet portable design measures 68 feet long and is offered in a 10-inch discharge configuration. The Wolverine also offers single-truck portability.